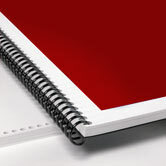 4:1 coil fits the widest range of document thicknesses, so it is generally the most popular of Plastic Binding solutions.Please check your punch to see if this pitch is right for you. The 36 inch length can be used for binding calendars or other large documents. It can also be cut down to fit multiple smaller books. We stock the sizes listed in this table, so call us now for the size and color you need. If all of your documents are Letter or A4 size, you may find 4:1 coil in 12 inch lengths easier to use. Page capacities shown below are the approximate number of 20# sheets. For an exact fit, measure your finished document and use the sizes under document thickness in the table. Don't forget to include your covers when measuring. Colors in the chart below may differ due to variations in monitors. If color is critical to your application, please request a sample book.